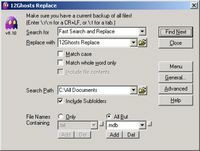 Automatically search for and replace text in an entire directory of files. 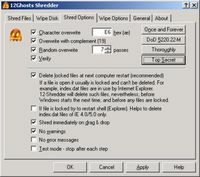 Overwrite files, drag and shred, DOD 5220.22-M conform, Wipe Disk. The best utility for Windows maintenance. 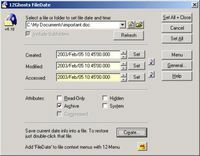 Change EXIF timestamp, file dates and other attributes. Qr for Indredimail is a simple and well guided step to recover data. QR for Linux can recover Linux Data from accidental file deletion from Hard Disk. QR for Lotus Notes is a simple and well guided step to recover data. QR for Lotus Notes is simple and well guided steps to recover data. It is a do-it- yourselfnon-destructive data recovery software. It is a Simple and well guided steps to recover corrupt Outlook (*.pst) files. QR can repair corrupt Powerpoint (*.ppt) files. It is a do-it- yourself non-destructive data recovery software. It is Simple and well guided steps to recover corrupt Outlook Express files. Best Data Recovery software for Novell Data Recovery Software, NWFS Net386 file. A simple, but still useful, easy to use and configure disk space monitor.